← Birmingham Vs Arsenal Match Report, Kevin Phillips Sticks Dagger Through Arsenal Hearts! An epic clash was on the cards when two titans of European Football locked horns at the Emirates Stadium on Wednesday 31st March. It did not disappoint. Barcelona flew out of the traps with an onslaught of early efforts at Manuel Almunia’s goal. Somehow, Arsenal were keeping them out, and as Ibrahimovic blasted high over the bar from all of 8 yards, there were perhaps an air of “maybe it was meant to be our night”. 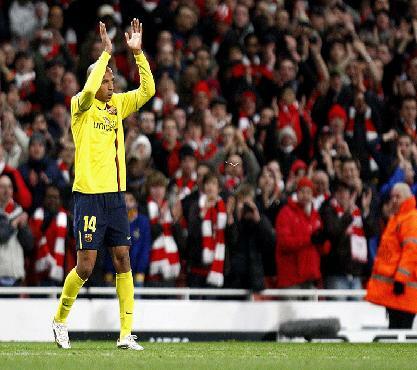 For now though, Arsenal had to batten down the hatches, and weather the Barcelona storm that threatening continuously. With the returning William Gallas and Thomas Vermaelen, Arsenal were given a huge boost and the formidable partnership that has seen Arsenal re-enter the Premiership Title chase looked to be ineffective against the Spanish giants, as ‘Almunia pulled off a host of impressive saves to deny Xavi, Messi and co.
Andrey Arshavin limped off after 27 minutes, and was replaced by the ever improving Emmanuel Eboue. Arsenal were beginning to come out of their shell, and as such taking more of an attacking approach and looking like their normal selves. Nasri cut in from the left hand side, but his right-footed curler went the wrong side of the post, much to the dismay of the Gunner’s faithful. Again, Nasri caused Barcelona havoc down the left flank, and his effort caused confusion between Sergio Busquets and Dani Alves to find Nicklas Bendtner free in the area, only to be denied by Valdes and then the post. The offside flag spared his blushes. Minutes later, Arsenal were dealt another blow, as former captain William Gallas was stretchered off after suffering a recurrence of his injury. For now Arsenal were playing with 10 men, and Fabregas fouled Busquets to earn a yellow card which will keep him out of the second leg at the Nou Camp. After the restart, Denilson replaced ‘Gallas as Arsenal were surely looking to capitalise on Barcelona’s inability to convert chances. It was a short lived plan as Puyol hoisted the ball forward, Ibrahimovic ran onto it and lifted it past the oncoming ‘Almunia. A stark contrast to the “total football” that normally generates their goals, but nonetheless, they deserved it. 0-1 Barcelona. Nicklas Bendtner almost equalised 10 minutes later, but his header from Clichy’s cross was saved by Valdes. Just as Arsenal seemed to be getting back into their stride Ibrahimovic finished emphatically to knock the wind out of Arsenal’s sails. 0-2 Barcelona. Wenger used his last roll of the dice to allow Theo Walcott to enter the fray, replacing Sagna. It turned out to be a stroke of genius as the 21-year-old had an immediate impact, linking up with Nasri and Bendtner to slot cooly under Victor Valdes. 1-2 Barcelona. With less than quarter of an hour to go, Walcott’s opposite number, hero and Arsenal legend came on for the opposition. He received a fantastic reception but proved ineffective against his former side, as Arsenal weren’t finished yet. Carles Puyol clattered into Fabregas in the penalty area, and received a red card, ruling him out of the return leg. Fabregas delivered from the spot to earn Arsenal a 2-2 draw, which the majority of pundits would not have envisaged after Ibrahimovic had doubled Barcelona’s lead. Whilst returning to the Arsenal half after his penalty, Fabregas stopped and examined his leg, fearing that something was very wrong but he remained on the pitch for the final minutes, he awaits scan results to see the full extent of which is reported to be a suspected broken leg. The Arsenal fans are praying it is not the case.